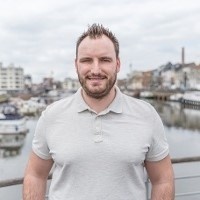 Stijn's a technical coach for the Development team, keeping a close eye on the quality, maintainability, structure and architecture of the code as well as the general development process. It’s his purpose to have people in his team improve and grow their technical skill set. Next to that, he has ownership of the backlog of all technical tasks to maintain and makes sure we properly follow industry standards and best practices. He’s a firm believer of domain-driven design and test-driven development, loves anyone with great problem-solving skills and never passes up on an opportunity to draw on a whiteboard. In his free time, he’s also busy cracking data as he meticulously registers results of Belgian athletics competitions in a team of volunteers.